As a Atlanta wedding photographer I love engagement photography. It is a time that I can give the couple my undivided attention. Also it is a much more casual setting that the wedding day. When I do engagement photography I am always talking getting to know the couple and what they are comfortable with. This gives me ideas on how to shoot them. When it is just the couple and I they are much more relaxed and they feel free to be theirselves. I just usually walk around and I will get them to stop when I see some good light as in the picture above. I then let them just have fun. That way the can relax and not worry about posing. I will give suggestions when asked but most of the time the best photos are when the couple are just being theirselves. While I love taking the photos what I like best when I am doing the engagement photography is getting to know the couple. Detail Shots Are So Important! Well wedding season is starting up and I finished my wedding I shot last weekend. It was a wonderful ceremony and two great people. It is an honor being a wedding photographer in Atlanta. I have been photographing weddings for a while now and it is always neat to see what shots are my favorite. Usually they are the least expected ones from a wedding. This photo came from just a quick little act of kindness from the groom. He took the brides hand and kissed it. Such a nice gesture and made for such an interesting photo. It are these little detail shots that capture the little moments of the day. This shot captures the love they have for each other in an almost abstract way. It is like a little microcosm of the wedding. I know it has been a while since I posted. Recently I have been blessed to be very busy with a lot of diverse photography Projects. I just came back from Saint Thomas, Virgin Islands. While there I was doing photo documentation of the historic sites on one of the islands there. It is an honor to work on such a wonderful and unique project. Everyone has been so supportive! Here is a quick photo I took through one of the windows of a house at the project area towards a historic battery there. I hope you enjoy the photo as much as I enjoyed taking it. I recently had the pleasure of shooting a wedding at the Indian Hills Country Club. It is located in East Cobb County. The club has 27 holes of golf and has a beautiful clubhouse. What really impressed me the most is the staff. The staff were a great team to work with. They were helpful to the vendors and the most importantly they were there to help in the bride in any way they could. The Clubhouse has a bar and full kitchen. There is a balcony and a terrace with a fountain downstairs below the balcony. It tastefully lit at night. During the summer there is a wonderful breeze for your guests. The upstairs dining area is very spacious and spills onto the balcony overlooking the golf course. It was so nice to have the fresh air coming in during the reception. Atlanta Wedding Photographer Sitll Shooting Film with Large Format Camera! I hope that everyone has enjoyed the 4th of July weekend! I wanted to share that I am still shooting film. I have had the honor of shooting some wonderful pieces of history in the last couple of years. My latest projects have included documenting several buildings at Cape Canaveral NASA facility that were part of the Space Shuttle Program. I have always liked the quality of film and the challenge of shooting with a large format camera. I have been shooting with a large format Sinar camera with plenty of tilt and swing. They are capable of getting incredible detail and the film can be kept at the Library of Congress to be shared for generations to come. I am starting to see some of my photos being published at the library of Congress. You can go to: http://www.loc.gov/pictures/resource/hhh.ga0910.photos.208771p/ and see one of my favorite photos. I was part of a team that documented Henry Fords Plantation at Richmond Hill Plantation, Georgia. This particular photo was a long exposure of almost 15 minutes. 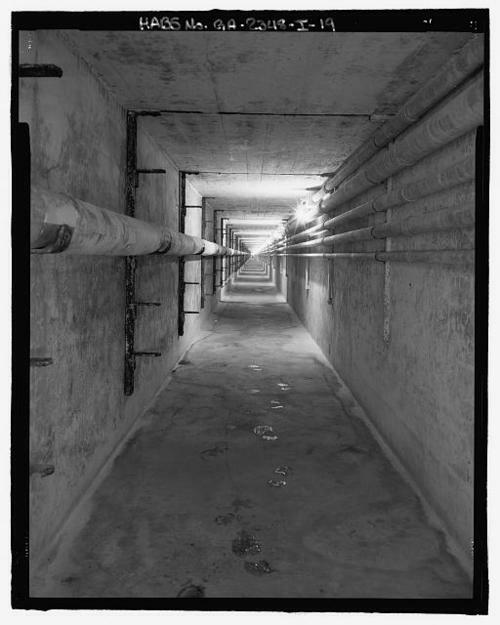 It is a photo of the tunnel under the Henry Fords Laboratory that connected to the mansion. Well things are really happening now! I have recently started publishing on wedding wire, brides.com, weddingbee.com, weddingwire.com, tumblr.com, Pinterest.com, and twitter.com. This week I have made a video of some of my favorite wedding photos. I do hope that you enjoy it. The are from numerous weddings all around Atlanta. It as quite a trip down memory lane. It was so nice to see all the photos from the past. What an honor it has been to part of so many weddings. I hope you enjoy the video as much as I did taking the photo and making it. Thank you so much for visiting! Please feel free to call me at 404-578-6982 and I will be happy to help you in any way that I can. Hello everyone it has been a while since I have posted. I just have to share how excited I am for my next wedding. My next wedding will be at the High Museum of art. I am so excited!! Ever since I have moved to Atlanta I have ad mired the High Museum. I have mentioned in other posts that there is a trend to have weddings and or receptions at museums in Atlanta. I think that is a great idea! A wedding is work of art and should be treated with the love and respect that a wedding is. Each is unique and beautiful. They are both are to be cherished for a life time.